From six inch up to six foot trophies and everything in between. 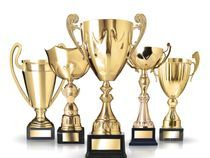 We have the ability to customize trophies for your trophy needs. 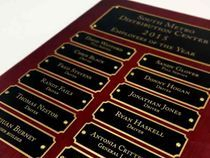 We offer multiple sizes, choices of wood, and different color plating for custom plaques. Different colors for engraving also. 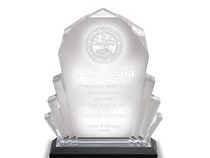 Acrylic Awards are a great way to show appreciation to those who have gone above and beyond. 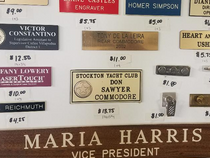 From custom plastic name plates to custom metal engraved plates of just about any size. CLOSED ALL MAJOR HOLIDAYS! WEEK VACATION AROUND END OF AUG./BEGINNING OF SEPT. AND A WEEK BREAK AROUND CHRISTMAS. 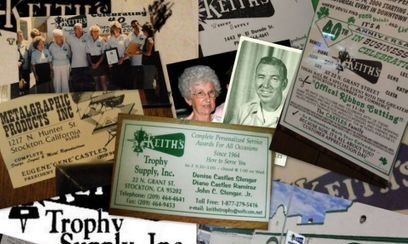 Keith's Trophy Supply Inc. started back in 1964 when Eugene Castles thought of starting his own business. With a little help from some of his buddies, that thought became reality. Castles wanted something he could pass down through the family and something that would keep food on the table. Nobody thought a little family trophy business would last this long but it has. 50 years and counting, Castles' kids and grand kids along with his sister Lela Kuntz, Beverly Castles, and many employees along the way have kept the business going to make "Pops" proud. Today Denise, John, and Brianna are here to make your awards dreams become reality.